Stuffed shells and Neapolitan meatballs, anyone? I love watching The Chew on ABC Daytime, and not just because I work for an ABC affiliate, but also because I love the chemistry between the hosts. Mostly, though, I always wait with baited breath for Mario Batali’s latest recipe. The way Mario walks the audience through a recipe is fun to watch; he makes it sound so do-able, and obviously, so delicious. I was tantalized by the Neapolitan meatballs in red wine rosemary sauce he recently made on the show, so I made them on Sunday for my family, along with my Italian sausage-stuffed shells. It was a great dinner! Here’s the link to Mario’s meatball recipe. 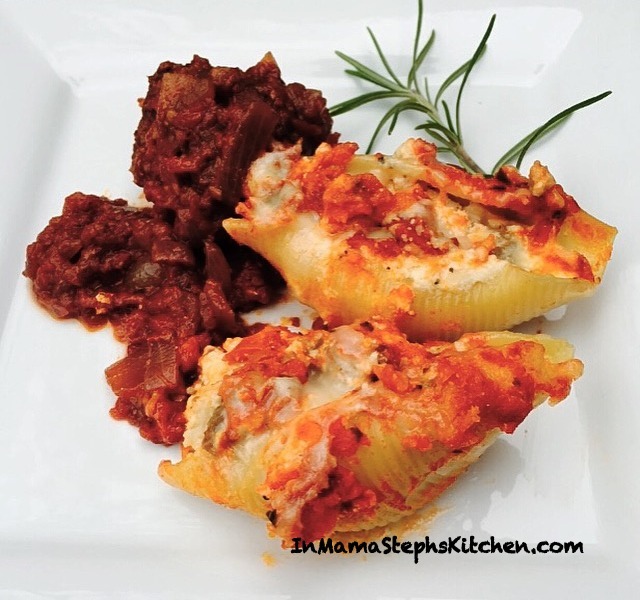 And here’s how I make my stuffed shells…a recipe you’ll want to enjoy as soon as possible, take my word for it. They’re firm, full of flavor, and have a nice, creamy ricotta filling. 12 oz package large pasta shells, cooked al dente, according package directions. 4. To the hot sausage, add the ricotta, one cup mozzarella, 2/3 of the Parmesan, eggs, herbs, and salt and pepper, stirring to combine well. 5. In a 9×13 baking dish, pour one one to one and a half cups into the baking dish, and spread to cover the bottom. 6. Use a teaspoon to fill each of the shells with the sausage filling, then place in baking dish. 7. When the dish is full (I had to pack tightly), pour over the remaining marinara sauce. 8. Top with the remaining mozzarella and Parmesan. Cover with foil and bake for about 30 minutes. You can remove the foil after 30 minutes and allow the top to brown before removing from oven. Let stand for a few minutes before serving. For our family dinner on Sunday, each person got two or three meatballs, three shells, and garlic-cheese bread. And then several went back for seconds. (Remember, I’m feeding three college boys here). It was INCREDIBLE. I hope when you’re ready for an Italian-style comfort food meal, you will give either of these recipes a try. Or both! And keep in mind…the leftovers. Oh, the leftovers… they’re even better than the original meal. You’ll have the best lunch in the building at work the next day! In personal news, our family took in a dog I found on a mastiff rescue site. 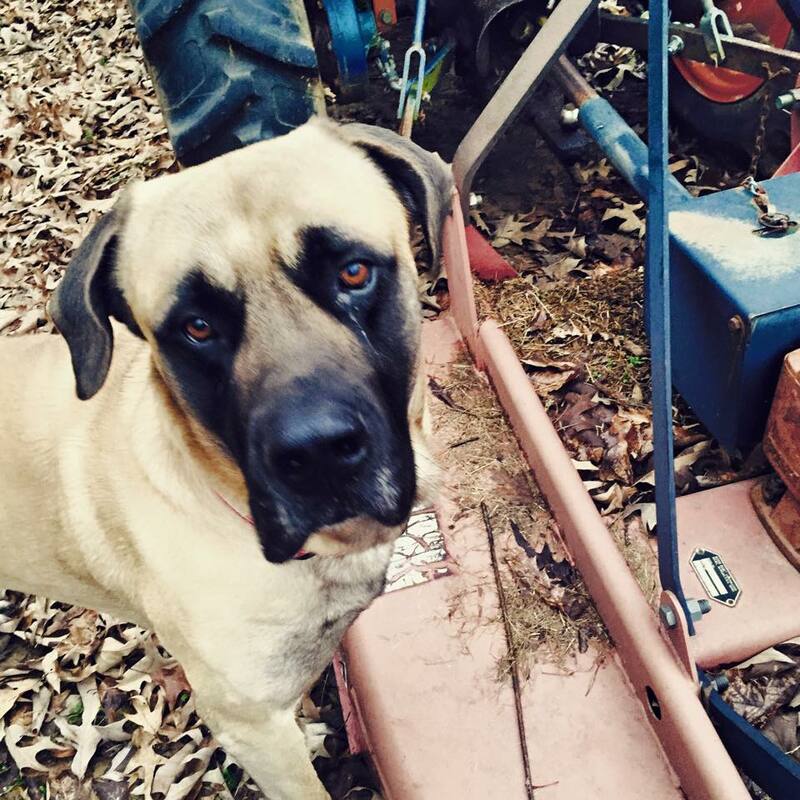 Bo is an English Mastiff, a breed we love very much. I’ve written and shared pictures here about our first English Mastiff, Abby, who died in November at age 10. Bo was being re-homed for a second time, so we took him in last week and we love him already! He’s so sweet-natured and cute! Check this angel out!